-You can easily make this scarf for any one by simply adding additional rows of daffodil. 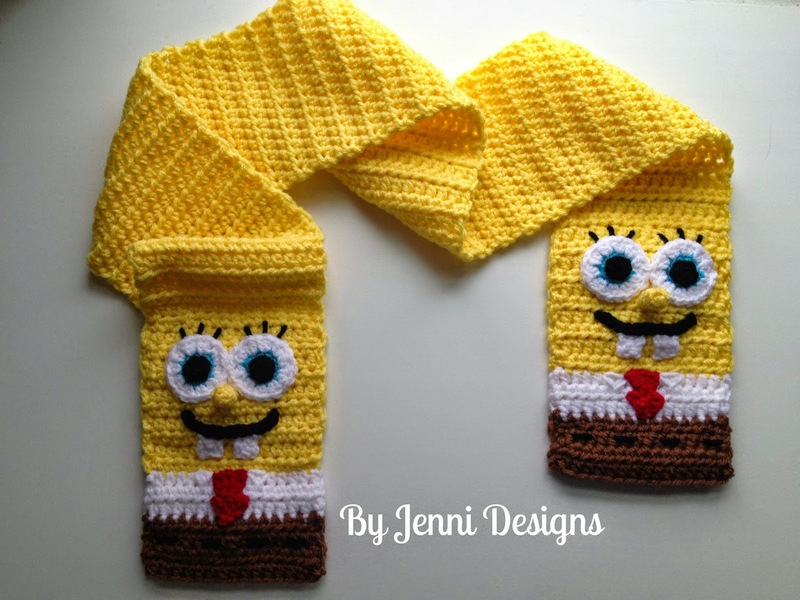 -After completing the yellow section of the scarf you will be making the shirt and shorts at each end. This piece will be folded in half to hide all the sewing you have to do to attach the face pieces. Be sure when you fasten off these rows you leave the ends long enough to whip stitch the sides of the scarf together. Row 1: Ch 16, Hdc in 2nd ch from hook and in each across. Ch 1, turn. Row 2-111: Hdc in same and in each across. Ch 1, turn. Fasten off after row 111. Row 1: Ch 1, Hdc in same and in each across. Ch 1, turn. Row 2-3: Hdc in same and in each across. Ch 1, turn. Fasten off after row 3 and join with Toffee. Row 4: Ch 1, Hdc in same and in each across. Ch 1, turn. Row 5-7: Hdc in same and in each across. Ch 1, turn. Row 8: IN FLO: Hdc in same and in each across. Ch 1, turn. Row 9-11: Hdc in same and in each across. Ch 1, turn. Fasten off after row 11 and join White. Row 12: Ch 1, Hdc in same and in each across. Ch 1, turn. Row 13-14: Hdc in same and in each across. Ch 1, turn. Fasten off after row 14 and join Daffodil. Row 15: Ch 1, Hdc in same and in each across. Ch 1, turn. Fasten off after row 15 and join Daffodil. Row 16: Ch 1, Hdc in same and in each across. Ch 1, turn. Row 17-26: Hdc in same and in each across. Ch 1, turn. Fasten off after row 26. Magic circle, 10 hdc. Join. Fasten off. Join White: Ch 1, 2 hdc in same and in each around. Join. Fasten off leaving long enough end to sew on to scarf. Magic circle, 5 sc. Fasten off. Sew on to center of turquoise. Row 2-4: Ch 1, sc in same and in each around. Join. Fasten off and sew end of nose shut, making sure not so make it pointy. Stuff with yellow yarn bits or poly-fil. Leave end long enough to sew on to hat. Ch 4, dc in 3rd from hook, dc in next. Ch 1, turn. Sl st over 2, ch 2 in corner, 3 dc in same space. Fasten off leaving end long enough to sew on to hat. Row 2: sc in same & in next. Sew all the pieces in to place, using black yarn weave through the belt and use white to stitch on a little collar. After the pieces are sewn on your scarf it should look like the one shown below. Fold brown section in half, it should fold easily since we only worked in the FLO. 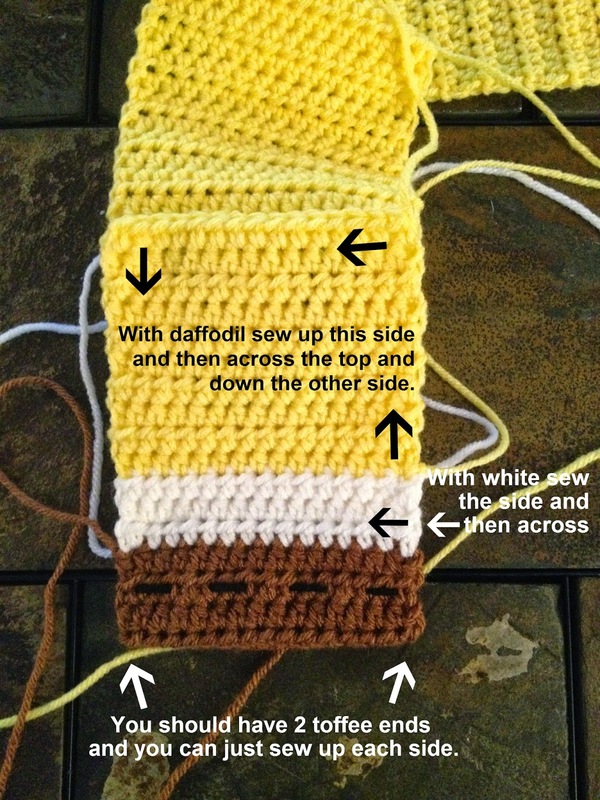 Now stitch the sides of the scarf together, below is an explanation of how I sewed it together. Be sure when you sew across the top that you don’t let the eyelashes show through the back of the scarf, they should be covered. Also, when you sew across the scarf take care to pay attention to the front and make sure your stitches are hidden. Do the same on the other side and you are all done! Great pattern! 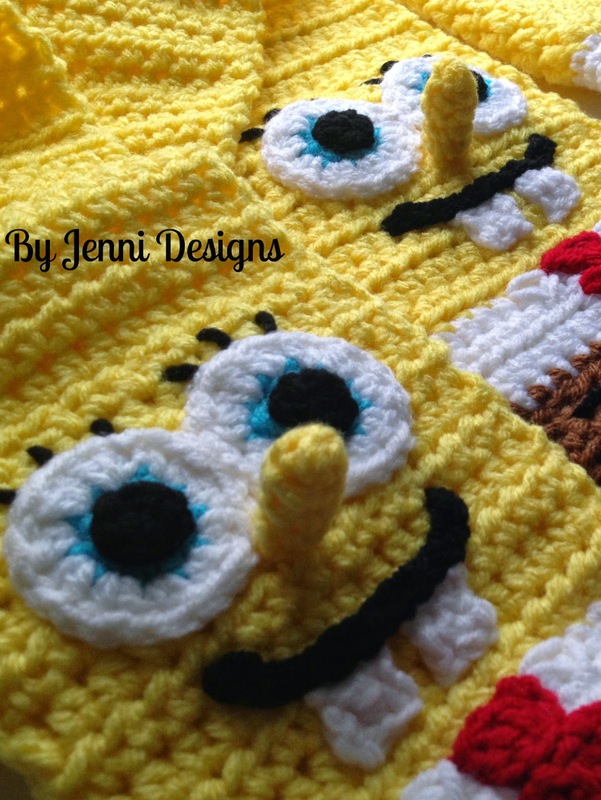 Have an adykt friend who is a SpongeBob fan and would like to make one for him but think it would need to be a bit wider (as well as longer). Making it wider looks easy enough. I would just have to make the eyes and mouth fit the width. Any other suggestions? Thanks in advance!